The recession in corporate profits is about to get even uglier. Blame the oil crash and strong dollar. Wall Street is bracing for a 7.9% plunge in first-quarter profits in S&P 500 companies as earnings season kicks off next week. That would be the deepest decline since 2009, according to S&P Global Market Intelligence. It's part of a broader profit erosion gripping U.S. companies due to the dramatic drop in oil prices, currency turmoil and just plain slow global growth. S&P said profits are on track to decline for the third-straight quarter, the longest losing streak since the Great Recession. None of this is good for the stock market, which has risen dramatically over the past two months as economic fears have eased. "This earnings season does have the potential of upsetting a rather fragile apple cart," Peter Kenny, an independent market strategist, wrote in a recent report. Related: Optimism about America's economy is fading. Fast. Energy on track for first loss. Ever. Earnings season unofficially kicks off next week when Alcoa (AA), JPMorgan Chase (JPM) and Citigroup (C) all report first-quarter numbers. Despite the recent rise in stock prices, first-quarter earnings estimates plunged by 9.6% since the start of 2016. That's the largest decline also since 2009, according to FactSet Research. 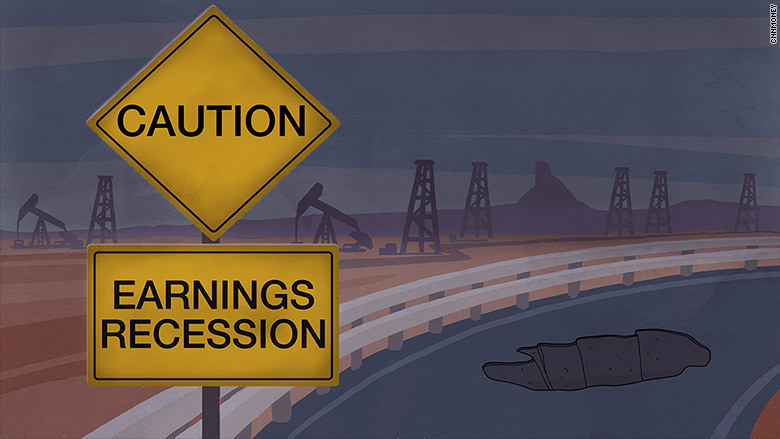 Cheap oil deserves a chunk of the blame for the bleak profit outlook. The S&P 500 energy sector is on track to post a loss in the first quarter for the first time since S&P began tracking these numbers in 1999. Keep in mind these estimates are based on non-GAAP numbers, meaning they exclude "all the bad stuff" like one-time restructuring costs. Still, this would be just the second time any of the S&P 500's sectors suffered a quarterly loss. The last time? During the financial crisis in 2009 when the financial sector was melting down. But it's not just oil. Excluding energy, S&P 500 profits are still expected to decline 3.7% in the first quarter. That's where the one-two punch of the stronger U.S. dollar comes in. Not only does a more valuable dollar make products sold overseas more expensive, but it erodes revenue when translated back into American currency. It helps explain why tech companies are bracing for a 5.9% decline in first-quarter profits. Multinational giants like Coca-Cola (KO) and Boeing (BA) that make a big chunk of their sales overseas are also expected to post profit declines. In fact, just three sectors in the S&P 500 are on track for profit growth: healthcare, telecom and consumer discretionary, which have benefited from cheap oil as consumers have more to spend shopping and going out. Of course, it's important to remember that CEOs have a long history of giving ultra conservative profit forecasts that they can easily beat, causing their stocks to pop. That game may have gotten a bit out of hand this time around given the market turmoil that occurred earlier this year. It's easy to forget now but just earlier this year the Dow was down about 2,000 points on the year and the Nasdaq was nearly in a bear market. "Analysts got pretty nervous. I think they may have cut estimates perhaps too far," said Lindsey Bell, senior analyst at S&P Global Market Intelligence. And don't forget, the big headaches of oil and the dollar no longer look so scary. Oil has recovered as low as $26.05 a barrel in February to nearly $40 now. And the U.S. dollar has been in retreat mode thanks to the Federal Reserve dialing back its plans to raise interest rates. Those shifting forces have led some observers to say first-quarter earnings season may mark an inflection point. "These drags have already begun to abate and are poised to potentially stage powerful reversals," Burt White, chief investment officer for LPL Financial, wrote in a recent report. Let's hope so because stocks are starting to look more expensive, meaning stronger profits may be needed to justify further gains. The S&P 500 is trading at 17.6 times 2016 earnings, compared with its 15-year average P/E ratio of 16, according to S&P. "The next hurdle on the wall of worry for stocks is likely valuation," John Stoltzfus, chief market strategist at Oppenheimer & Co., wrote in recent report.